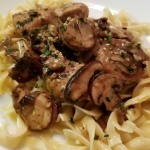 Pork Tenderloin Medaillons – Médaillons in French but I could also call them pan fried pork medallions – in garlic mushroom sauce! Truly a quick and easy way to prepare a pork tenderloin dinner. Seared tender morsels of pork covered with sautéed mushroom medley and coated with a thick garlic sauce. Over buttered noodles. 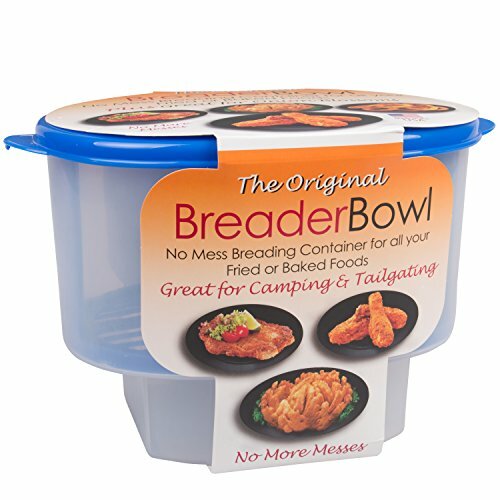 Are we hungry yet? I know I was last night so dinner had to be quick and easy. Most pork tenderloins are in the two to three pound range. Much too big for the two of us so I reached (without really looking at the label) for what was a much smaller tenderloin. Niman Ranch Cookbook: From Farm to Table with America’s Finest Meat It was pricey for .96 lbs but I am now pleased to have found Niman Ranch® meats. Look for them. They are worth every penny in all natural flavor and freshness. That is not to say that I have not used the larger tenderloins but those are perfect for breaded pork cutlets. I was looking for small médaillons of meat that could easily be pan fried in minutes. The largest médaillons of the Niman tenderloin was no more than a couple inches across. This recipe is about as quick and easy as it gets. Well… not as quick as opening a can or pushing the timed cook feature on the microwave but as recipes go, this one easily falls into the “30 Minute Meals” category. Russian Stroganoff is a quick BEEF recipe with mushrooms and sautéed onions. And that’s a good thing because there are occasions when time is of the essence and semi-homemade ingredients are perfect. I use what is within reach and love to improvise when it comes to cooking. Why make it difficult or fussy when those sitting at the table just want to eat and have few clues as to what goes into making dinner. Case in point just last night! “I had no clue it took that long to make short ribs!” Need I say more? This recipe is perfect for those days when the magic wand needs a new battery or the kitchen needs a full time cook. Can’t Find Niman Ranch® Meats? Get all natural Kurobota pork tenderloin! 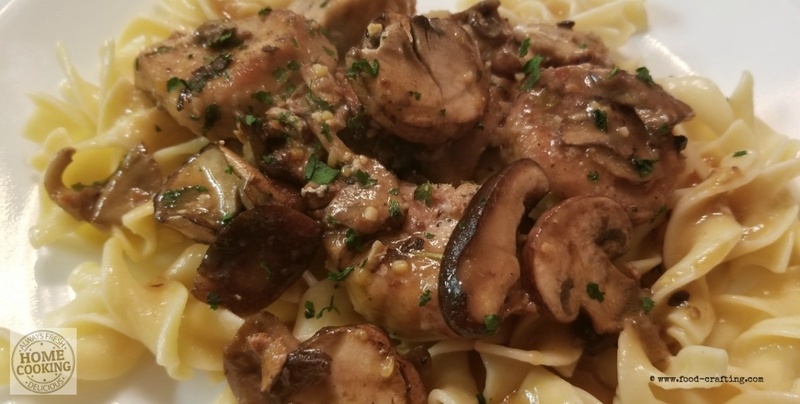 Tender pork tenderloin medaillons seared to a golden brown, topped with a sautéed mushroom blend and coated in a rich and velvety garlic sauce. A quick and easy recipe. Follow package instructions to prepare egg noodles. Bring the water to a boil then set to low as you prepare the rest of the recipe. I always salt the water and often add a drizzle of olive oil to the water to keep the noodles separated. Prepare the mushrooms first. In a hot frying pan, add the mushrooms to sauté until the edges takes on a hint of color. Do not let the mushrooms render any liquid. Remove from the pan and set aside. Season lightly with salt and pepper. Wrap the pork tenderloin in a paper towel and pat dry. Hold the tenderloin in a firm grip and starting at the wide end, using a very sharp knife, cut 1/2 inch thick slices. As you get to the narrow end, do not cut médaillons smaller than 1 inch in circumference. In a shallow dish like a cake pan, sprinkle some pan searing flour and place the pieces of pork in a single layer. Sprinkle with additional flour and shake to coat evenly. Time to cook the noodles as you finish the recipe. Eggs noodle are quick to prepare! To the same frying pan in which you sautéed the mushrooms, add a couple tablespoons of olive oil. Carefully place the pieces of pork in the pan and sauté them until golden brown, flip over and sauté until the other side is golden. By the time the meat if done frying (do not overcook – just brown the meat), the noodles should be nearly done. Place the contents of a tub of chicken stock in a 1 cup measuring cup. Using the small ladle, take a couple scoops of boiling pasta water and add to the measuring cup to dissolve the chicken stock. Add the garlic paste to the hot stock. Stir to combine well. Lower the heat under the pan and slowly pour the dissolved chicken stock to the meat/mushrooms in the pan. You want a nice creamy sauce and there is more than enough flour coating the meat to thicken almost instantly. In fact, to achieve the desired consistency, you may need to ladle another ladle (or two) full of pasta water to the frying pan. Rock the frying pan carefully to distribute the sauce through all the pieces of meat. You want to coat the meat and mushrooms. Drain and serve the pasta. Spoon the meat and mushrooms over the pasta and drizzle any extra sauce over the pasta. You know you’ve hit the jackpot when everyone eats in total silence. Full disclaimer 🙂 I skipped the measuring cup! I made space in the middle of the frying pan and added the chicken stock directly to the pan. Then I ladled the hot liquid to dissolve the stock, swirling the liquid around to distribute it evenly as it dissolved. Sometimes, you just have to “get it done”! Knorr Homestyle Stock Concentrated Broth, Chicken 4.66 oz, 4 ct (Pack of 4) When I want to sear or brown any piece of meat, I reach for my commercial grade hard anodized aluminum cookware. You could also use cast iron as long as you can set the heat to HIGH without any fear of warping the pan. To cut the meat in clean slices, use a very sharp chef’s knife with medium length blade. As for sharpness… you want the blade to cut through the meat like a knife through butter – effortlessly! Among my favorite kitchen gadgets are the small ladles I use for a variety of recipes but especially when preparing sauces. Next to the range, I have a narrow six inch wide drawer full of spatulas, long blade knives, a long handled meat fork and ladles in several sizes. Not soup ladles but ladles in ounce measurements. And my little two ounce ladle came in very handy when making the garlic sauce for this recipe. There are two ways to make this sauce – a more careful and measured method involving a measuring cup and more mixing and more cleaning or the quick and easy method. That’s the one I used. It worked only because this is not the type of sauce that requires carefully measured ingredients and an easy touch. This is not a velouté or a roux.